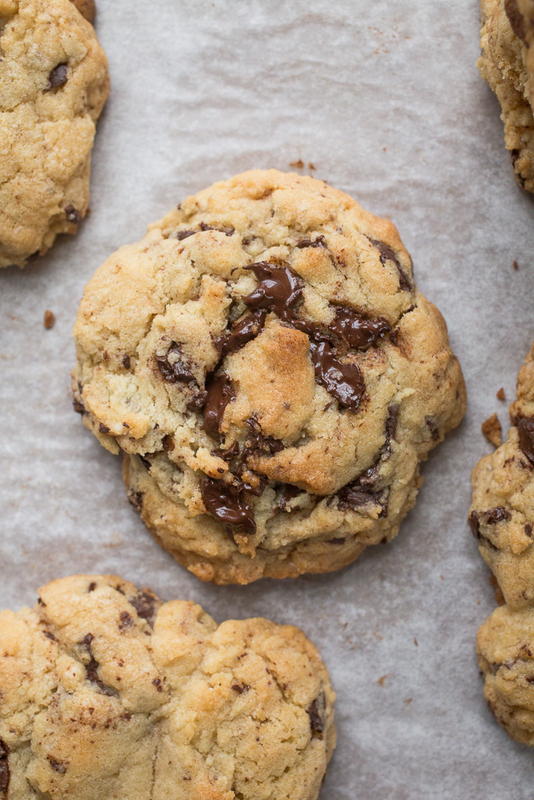 So to be honest, I have a perfectly perfect chocolate chip cookie recipe. For, oh I don’t know, 6 years, it’s the only recipe “plain” chocolate chip recipe I’ve needed. Sure, some peanutella stuffed cookies happened. And so did espresso dark chocolate coconut. But I decided recently that it was time to branch out and try a few of the other recipes that people have been raving about for so long. 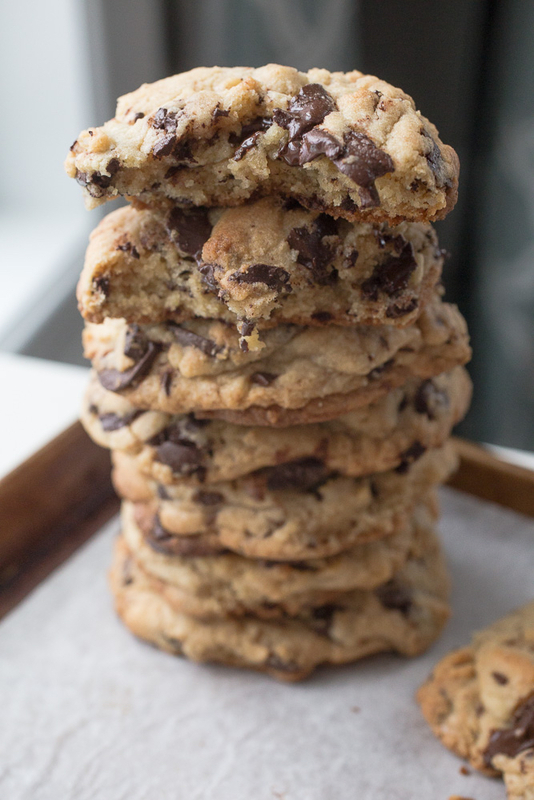 I started with these giant dark chocolate chunk cookies. This recipe is a copycat version from the famed NYC-based Levain bakery. In my opinion, basically anything worthy of succeeding in NYC is worthy of going in my stomach. New Yorkers are tough people to satisfy. I know – I used to be one of them. While I didn’t make it to Levain when I was in the city with my girls last spring, I feel like after these cookies, I really need to commit to going the next time I’m down there. Because, ummm…they’re pretty darn fantastic. 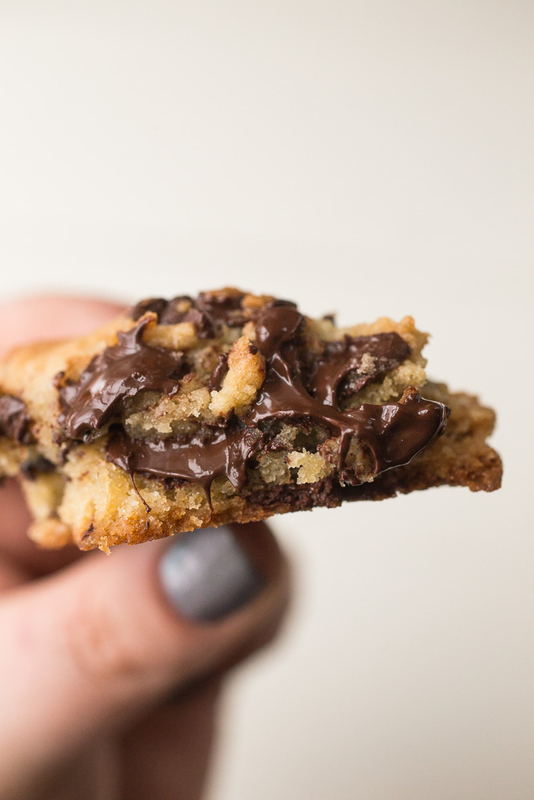 It’s the combination of puddles of melted dark chocolate chunks, crisp exteriors, soft interiors, and a hint of richness from a higher brown:white sugar ratio that make these cookies so great. Compared to my long-time favorite recipe, this one yields a little bit more of a cake-like cookie – just a touch – but this didn’t turn me off at all. In fact, I “forgot” to freeze most of the dough before baking and ended up with a dozen Levain copycat giant dark chocolate chunk cookies. Not that either one of us complained about this over the next few days. I don’t think you will either. In the bowl of a stand mixer fitted with the paddle attachment, beat the butter at medium speed until it starts to break down and reform into a misshapen ball, about 1 minute. Add the sugars to the bowl and beat for 2 minutes. Mix in the eggs and vanilla at medium-low speed until incorporated - the batter will be lumpy. Scrape down the sides and bottom of the bowl. With the mixer on low, gradually stir in the flour mixture. 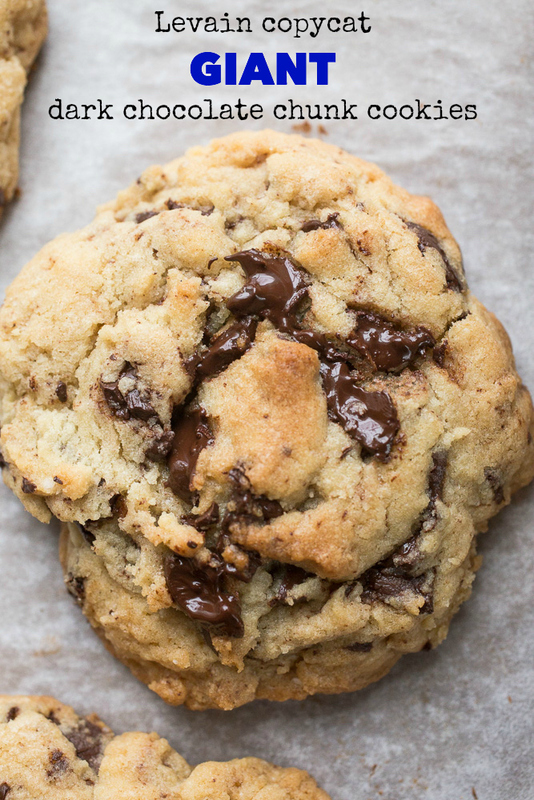 When no streaks of flour remain, stir the chocolate chunk in on low speed. With a large cookie/ice cream scoop, divide the dough into 12 equal pieces and space them 2 inches apart on the prepared baking sheet. Don't shape the dough into round balls with your hands - you'll want them to look a little rustic. Refrigerate for at least 2 hours or up to 12 hours. Preheat the oven to 375 F with a rack in the center of the oven. Bake for 18-22 minutes, rotating the pan halfway through, just until the tops are golden brown and you can just about lift the edges up with a spatula without the cookie falling apart. Do not overbake - the cookies will continue to cook on the baking sheet while they cool. Transfer the baking sheet to a wire rack and allow the cookies to cool for 5 minutes before transferring them directly to the rack. In the bowl of a stand mixer fitted with the paddle attachment, beat the butter at medium speed until it starts to break down and reform into a misshapen ball, about 1 minute. Add the sugars to the bowl and beat for 2 minutes. Mix in the eggs and vanilla at medium-low speed until incorporated – the batter will be lumpy. Scrape down the sides and bottom of the bowl. With the mixer on low, gradually stir in the flour mixture. 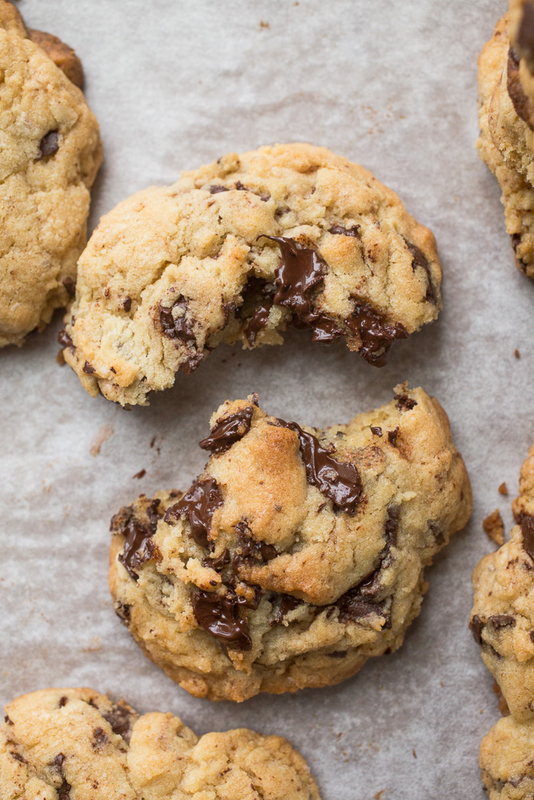 When no streaks of flour remain, stir the chocolate chunk in on low speed. With a large cookie/ice cream scoop, divide the dough into 12 equal pieces and space them 2 inches apart on the prepared baking sheet. Don’t shape the dough into round balls with your hands – you’ll want them to look a little rustic. Refrigerate for at least 2 hours or up to 12 hours. Preheat the oven to 375 F with a rack in the center of the oven. Bake for 18-22 minutes, rotating the pan halfway through, just until the tops are golden brown and you can just about lift the edges up with a spatula without the cookie falling apart. Do not overbake – the cookies will continue to cook on the baking sheet while they cool. Transfer the baking sheet to a wire rack and allow the cookies to cool for 5 minutes before transferring them directly to the rack. I LOVE and 100% miss Levain! These cookies could help make up for it! GAD!!!! The chocolate is just oozing out of these cookies. Be still my heart. Chunks really do make a difference. these were so good fresh that i can’t wait to make them at home! and i love how gooey/ost they are in the middle and crispy on the outside. I’m DYING to try them from a Levain shop and can’t wait to make it back into the city again – they’ll be on my list for sure! Huh, that’s interesting. I’ve made this recipe several times without this issue. Have you checked your oven temperature with an oven thermometer? Do these still seem raw when cut open after fully cooled? I haven’t tried your recipe yet but have been experimenting with my own. Various temps/times all produce the same result..beautiful outside and seemingly raw inside. I’ve let them cool for a little while but not a super long time. I’m wondering if I’m just being impatient and need to walk away for an hour! I’m so sorry for not responding sooner, Robin! It’s been a while since I’ve made these cookies so I don’t remember exactly if they were a bit undercooked when finished baking. I don’t think they were though. You can see a really good close up of the inside of the cookie in my post, which was taken while the cookie was still slightly warm. The insides should be a wee-bit on the cakey side – but not overly so – rather than the chewy side. In any event, they are freaking delicious! 🙂 Let me know how your experiementing goes – I’m interested to see how your versions go! No-Bowl Double Mocha Snack Cake + a King Arthur Flour giveaway!